Have you ever dreamt of living in a home with hotel-quality floors? Now, it is possible to have them in your existing home. Decorative concrete aims to provide more affordable and easier to maintain flooring options than the traditional ones homeowners are used to, such as carpets, tile, and wood. Concrete has always been a reliable material but more for its durability and versatility and not so much on how it looks. Although there are those who enjoy the utilitarian appeal of raw concrete, some would like to have something more decorative, especially for residential settings. Why Choose Decorative Concrete for Your Home? When it comes to appearance, decorative concrete goes all out. The wide selection of colors, patterns, and textures gives you the opportunity to customize a look that would be most suitable for you and the current theme of your home. Resurfaced and refinished concrete surfaces will help increase the resale value of your property. For such a minimal investment, your home is appraised at a higher value. If you do decide to sell your home, the resurfaced and refinished concrete will surely attract several buyers. 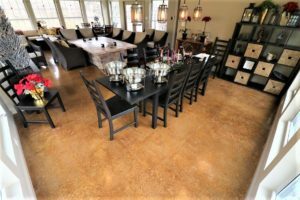 Decorative concrete is such an economical choice because it retains the existing floors you have and just enhances it to make it more appealing, more durable, and more appealing. Concrete Patios – This outdoor living space could benefit from a stamped overlay in a brick or natural stone pattern. The overlay is visually stimulating, slip-resistant, and effective in covering minor surface damage. Concrete Pool Decks – A spray knockdown texture is highly recommended for pool decks. The spray-down coating is slip-resistant even when wet. Also, it stays cool to the feet even after long hours of exposure to sunlight. Concrete Driveways – A stamped overlay and a spray texture are both ideal concrete driveway designs Denver, CO. They both enhance traction and both are resistant to most outdoor elements, like weather changes and vehicular traffic. Garage Floors – The garage is used for many other things aside from being a place to park the car. As a storage unit, workshop, and more, it deserves a flooring material that can withstand heavy use. Residential epoxy flooring and polyaspartic coating are both highly resistant to impact, abrasion, chemical spills, and more. Interior Floors – Concrete staining is a great way to turn any plain concrete floor into a luxurious looking floor in a color that you like most. Acid and water-based stains come in a variety of colors, from pastel to earth tones. Entrust Your Residential Floors to the Experts. Call (720) 545-1766 to Speak to One Now. We at Denver Concrete Artisans have a good idea of what it is like having to live around ugly, damaged, or boring concrete surfaces every single day. Our team makes sure that our customers won’t have to deal with that every day. How? Through top quality decorative concrete solutions. We specialize in resurfacing, refinishing, and repairing concrete pool decks, patios, driveways, and other residential floors in the Denver, CO area. Need more information? Let us help you out. Call us for a free consultation and quote.